STRANGE : The Doctor is OUT! There is something that is required to understand before reading this series (and my review of same). For a number of years, Marvel's head editorial committee believed that Doctor Strange simply "didn't work" as a headline character. Due to these "truths", they felt that Doctor Stephen Strange needed to be "torn down" in order to be remade. So it came to pass that editorial dictate had Doctor Strange suffer grievous injuries to his hands (while in the act of showing compassion and mercy to a friend-turned-foe who was merely "playing possum" - although, that damage could be seen as payback for betraying that friend in the first place), thus forcing him to utilize dark magicks which he could not control - and subsequently abdicating of his role and title of "Sorcerer Supreme" (since he was no longer "worthy"). * An excellent recap of these sequence of events can be found in a previous post [HERE]. It is into this climate - the one time that an impressive showing for Doctor Strange is absolutely CRUCIAL to help bolster sales of a solo series and to show that a magic-based series starring the "Master of the Mystic Arts" in indeed viable ... they give us... this. 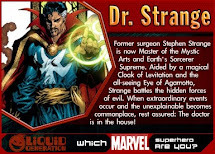 Maybe it's a kind of curse or something, but it seems that each time Marvel removed the "Doctor" from the title, what was left was faaar from "Strange". As one of the pre-eminent "Doctor Strange" fans and comic book magic-character centric bloggers active at this time, it may be seen as curious as to why I have yet to speak much of the most recent Doctor Strange "series"; a 4 issue mini entitled "STRANGE". Hey. Even the inimitable Neilalien is late to the table with this one. (Still, I know that great minds think alike - using this Memorial Day holiday weekend to work on it and as such his review can now be found [HERE]). I did broach the subject of some of my praises and perturbation of the first few issues in the "best" and "worst" categories of my 2009 "SANCTUM AWARDS" - from which I cribbed some of my own words for this review. *Those Sanctum-Awards can be found [HERE]. Yet, my hesitance to review the work while in progress was - for the most part - in an attempt to give the benefit of the doubt to writer Mark Waid, (who has been known to pen excellent tales,) and allow him to complete his story - especially since, as it progressed, my feelings toward the work fluctuated wildly. It wasn't all bad, mind you - in fact I had every hope that the series would end on a high note, and so I waited. Issue one was abysmal, but issue two scored a redeeming high-note, then the third destroyed nearly all good will that the previous issue managed to salvage, and then by the end... well... by the time that the series wrapped up - in such a patchwork manner, I found myself filled with such mixed feelings for much of it, that I waited for other concurrent Marvel magic series' to wrap up as well (Doctor Voodoo and a New Avengers storyline) - hoping for some sort of explanation, follow-up or anything with which to remove the mostly bad taste from my brain. Eventually, I let too much time pass, and then said to myself, "I'll wait for the trade edition and review the collected work". Which is what now follows. Behind a photo-retouched, fan-freakingly-tastically designed cover art by Tomm Coker & Daniel Freedman, Mark Waid starts off this series with a pedestrian issue about the fallen-far-from-glory Stephen Strange's attempts to prevent the culmination of a soul-stealing pact between a "gamesmaster" demon and a stadium filled with sports enthusiasts. The issue is marred by several points, but most specifically by the fact that the ending is ridiculously, easily guessed at once the demon is introduced and you learn his particular shtick area of "specialty". Doctor Strange appears undercover, portrayed as a minor-league-baseball-loving, "Swing Batta batta batta... Sa-Wing! "-taunting, "regular guy" while he is investigating a demonic upheaval that is taking place in a baseball stadium. First, I need say that is kinda nice to see Stephen seemingly be able to smile, kick back and enjoy life for a change. Strange states that he used to be a lover of the game way back before he had to bear the responsibility of the universe not getting all "wonky". While that might be the case, never, in Strange's documented history, would he be seen comporting himself like he was recreating a scene from "Ferris Bueller's Day Off" ("Sa-Wing, Batta!"). Certainly, this is merely a "front" he is using in order to get closer to Casey Kinmont, the granddaughter of the owner of the home team, so that he may gain access to her grandfather and warn him of the dire menace that threatens, not just his team, but everyone in the ballpark. While the mission is something that the former mystic master would have undertaken prior to his loss of rank as the "Sorcerer Supreme", the manner with which he is relegated to handle it now is more hand's-on. Indirect infiltration and confrontation, as opposed to his prior style of materializing and casting a "big magic whammy". This seems to be because here, in this mini-series, Waid has Strange physically unable to cast magic, due to the severity of the injury to his hands (caused by the Hulk crushing them during the "World War Hulk" mini-series). While these severe injuries should, in fact, be treated in much the way that Waid has handled it, it seems that he was the only Marvel creator to "get that memo" and do so. In every other appearance prior, concurrent and after this series, (Last Defenders, Thor, New Avengers, etc...) Dr. Strange seems to have little to no trouble using his hands to cast spells and work other magic. While he may state, in those other comics, that he is not as powerful as he once was, he is able to perform many complex spells. Such a dissonance with the rest of his "in-canon" appearances leaves readers with a sense of there being no one at the helm of this re-direction of Marvel's main mystic master. Sadly, editors, who once watched for such differences, are now little more than project-managers, simply making sure that product rolls out on time with little heed to any actual duties that are the responsibility of "editors". 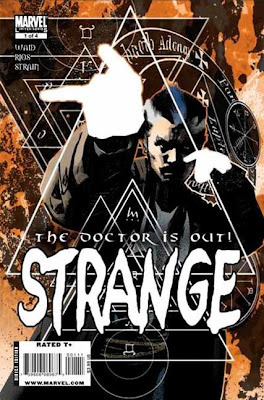 Here, in this titular series, Strange has hands so shaky that he is reduced to having others work magic for him, or having their hold his hands in certain "spell-casting" positions. He works no magic himself, save a scant two or three minor spells. Stephen casts a minor spell of revealing upon a pair of glasses worn by the young girl, Casey Kinmont, so that she may be able to see things as they really are - the magical nature that hides below a veneer of normalcy. He also quickly shows her how to cast a spell of "vanishing". Neither spell is meant to last more than several minutes. However, Casey is inexplicably able to retain the abilities which she uses with ease and increasing frequency. With this, Waid repeats a grievous sin that he was guilty of committing when he was writing his otherwise awesome run on the Fantastic Four (issue # 497-500 specifically); that of letting those untrained in magic be able to cast - with no difficulty - the spells that Strange spent many years studying at the feet of the Ancient One. Sure, by issue two we learn that the "normal" in question is an unusually adept "natural" magic user. That helped the case slightly, but it still irked, as Strange himself has often been stated to have been a "natural", but he still required intensive study in order to perform even the most basic of spells. Magic that he is no longer able to perform here, as Strange is obviously physically impaired and he wears black leather gloves in order to hide the damage. Yet, this does not keep Strange from striding boldly where angels fear to tread to deal with supernatural entities that no mere mortal has business confronting. The first such demon, is Tul'Uth, the Lord High Incubus of Games and Chance. There wasn't a single thing that I found interesting or engaging about this "menace". 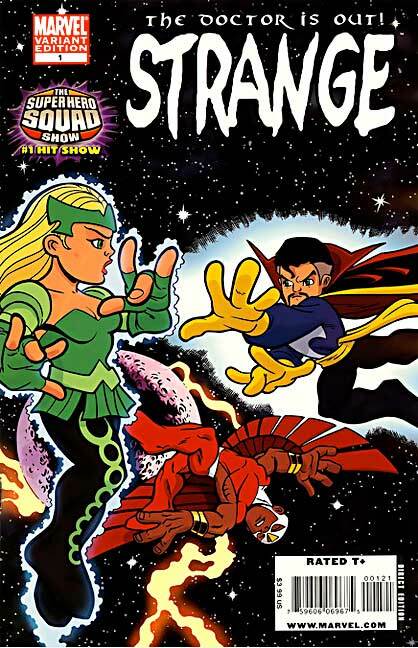 Poorly executed and truly lacking, this is a 4F villainous creation from an otherwise "best of" writer, Mark Waid. The "Unbeatable" Gamesmaster who is, in the end, bested by his own rules and contract. Tul'Uth tosses a particularly nasty wrinkle into the oft-used "souls-for-deeds" pact, but even that doesn't feel dire because we know way in advance how he is going to be defeated. I have to take umbrage at Tul'Uth's (and possibly Waid's) temerity as he(/they) state that Strange is "a legendary terrible bluffer". The same Dr. Strange who managed to win numerous gambits against the likes of Nightmare, Dormammu, Mordo and many other, usually far more powerful foes and entities with nothing more than a carefully worded bluff and one hand held, fingers crossed, behind his back? That Dr. Strange?? Yeah, I didn't think so. If this were Tul'Uth trying to gain a psychological edge by putting Strange down in front of those he is trying to protect, I could dismiss it, or even enjoy it. 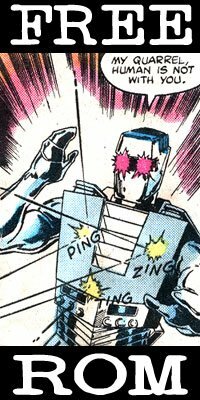 However, at no time does Tul'Uth give any indication of such a stratagem (nor Waid, nodding that this is merely a taunt at Doc while he is at his lowest ebb). And as such, it goes down as bad writing - poor research done on a character with a history of overcoming more powerful foes with naught but his wits and a winning "poker face". Tul 'Uth does have one thing going for him. Despite the overly garish, over-saturated, poor coloring of Christina Strain, she gives the demon the traditional color scheme of a comic book villain; purple and green (and grey). Purple skin, wearing a green and grey visiting-team jersey. Likewise, Strange is made more recognizable due to the fortunate happenstance of rooting for a team who wear a uniform comprised of a red jersey with gold edgework, over a blue shirt - replicating the general appearance of his old costume. Wearing his jersey unbuttoned, untucked and allowed to flutter a bit behind him, it looks at least slightly reminiscent of his Cloak of Levitation. These color choices were obviously intended and help to remind readers of who he is. While we speak of the visuals, I must voice my opinion that illustrator Emma Rios' work on this series is a poor fit. Rios' work in other titles (before and since this series) stand up much better than her work here. Her work isn't bad... far from it. She has proven herself to be adept at handling many types of locale and activity. It is somehow not a good fit in this instance. I've seen many of her other works, both in and out of comics - and they are all splendid! What seems to be wrong here is that her artistic skills on this title just aren't up to the same levels that she has shown elsewhere. Her ability to draw realistic environments and objects is exceptional. Possessing excellent design and spatial skills, she can illustrate just about anything. Yet, aside from and some genuinely interesting creatures, her "magical" design is lacking. And that is indeed odd, since I have seen her produce fantastic, fanciful works dealing with things mystical in nature. Just to prove my point, here is a piece that she produced for a festival in her home town in Spain. I mean, that's pretty sweet, isn't it? An excellent blending of magical, fantastical and realistic images to form a cohesive illustration. Perhaps her deadline on this "STRANGE" project was too tight? Or she was working on more than one project at a time? Or perhaps some other unavoidable deterrent prevented her from turning this into an artistic triumph. With the exception of the boring visual for Tul'Uth, every other other-dimensional entity is an interesting or totally unique creature. Still, one thing that is obvious in this series (and is evident in this issue) is that when the action gets hectic, Rios' artwork becomes a bit hard to "read". It seems, to this reader, that her mystical perception in these issues is an overly busy mass of wavy lines obscuring the action. In issue 1, the mystical menace is combated in an all-out, bottom-of-the-ninth, down by one with two outs - the tying runner on base and Stephen Strange stepping up to the plate. The magically controlled pitches are fantastic, and the motion and force of Strange's swings are palpable. Rios can certainly draw action scenes that bound with kinetic energy. However, when he has to run the bases, all hell literally breaks loose and it is darn near impossible to follow the action. The fault of the artwork does not fall completely upon the shoulders of Emma Rios, however. As noted earlier, the coloring by Christina Strain is an uneven compilation of hard-to-look-at neon hues and impossible-to-discern murky shades. In direct contrast to the solo piece I linked to above, where Rios pencils, inks and colors her own work, the coloring in this Strange series, by Strain and Staples is a red hot mess. I'm not sure if this was the direction given by editorial edict; to "brighten up" magic, but just about everything is far too colorful. Except... for when it isn't. If the color saturation isn't dialed up past 111, it is dropped down to negative ratios, and shades too dark and murky are utilized. Sometimes, the overly dark colors are placed directly next to the too-bright colors. This miasma of colors makes it difficult at times to see just what the heck is happening. In some instances, the coloring makes it downright impossible to see important details and events. Perhaps some of the fault does belong to Rios, as her art consists of naught but contour-drawing line-art, with her inking bearing no discernable differentiation of line quality. Nor are there any "spotted blacks" to be found anywhere in her artwork, instead leaving it up to the colorist(s) to provide light and shadow. There is one other thing that bothered me about Emma Rios' artwork in this series. She can't be faulted for her natural style, however. It's a common occurrence. It's just that a professional artist should be able to draw a multitude of facial types. Issue 2 helped regain some lost footing for the series, not only in the writing, but with the artwork of Emma Rios, as it was a distinct giant leap ahead from the first. Only the cover art by Tomm Coker & Daniel Freedman, which is dark, atmospheric and intriguing, is the only aspect of the issue that isn't better than issue one. but only slightly. This issue is a good showing for the severely depowered Stephen Strange as written by Mark Waid. It helps establish (or maintain) the seldom-visited aspect of Dr. Strange as extra-dimensional diplomat, as he is forced to use tact and assuring words instead of mystical forces to accomplish his goal: namely, the smoothing over of a wronged alien-being with whom a pact was accidentally broken. The culprit behind the broken accord; Casey, the young girl that Strange aids in the previous issue, becomes Doc's newest "apprentice". In fact, the real star of the issue is Casey, who embarks on a quest to find Dr. Strange who had vanished at the end of the previous issue. An interesting “modern-tech” riff is used as Casey is using Dr. Strange’s sigil-design to track him down via the web. Since the sigil bears a stylized “tic-tac-toe” board design, she calls it a “hash-tag” – so named after the “Twitter-like” “#” symbol. Casey's "origin" path mirror's Strange's own, as she starts off as a selfish, spoiled, rich brat, paying no care to the concerns (or even names) of others, but through loss is set upon a road to greater understanding. She searches the country for Strange, whom she sees as the one who possesses the power to answer her most burning questions / desires, much as Strange originally trekked to Tibet in search for the “Ancient One” in order to cure his hands’ (original) nerve damage. Slowly, she forgoes her own problems, and with the magic that she has learned is willing and able to step up to do what is right to try and put right the mystical wrongs of her own doing and those that affect the world as a whole. This reflects Strange's own foregoing of his selfish goals and willingness to let go of "himself" in order to better protect those that dark forces would threaten. Waid and Rios put the “true sight” glasses to good use here, showing the various people that Casey meets on her quest for just who they really are – inside. The artwork as a whole takes a huge step forward from the last issue. Rios’ designs and real-world settings are believable and very well drawn. However, the real success is that her rendition of Stephen Strange in this issue is much more in control and possessing of relaxed, yet in-command ease that is definitely the required look for Strange. She even manages to bestow a more “human” and “attractive” nature to him here. The overly bright and overly dark palette of colorist Christina Strain, while not quite right in the scenes where Strange is involved, worked somewhat better with the various settings of the story. It becomes readily evident that the color theory of this series is that bright greens and purples are the “primary” colors used when “magic” is happening, and other colors and shades are for the “normal” world. Now, I personally agree that the colors of magic are greens and purples. However, the only downside to that is that in printing, warm colors (reds, yellows), which the eye sees as “advancing” are used to show things that are in the foreground, and cool colors (blues), which the eye sees as “receding”, are used to tint items in the background. Green (which is made of yellow and blue) and purple (red and blue) are both warm AND cool – and as such wreak havoc with spatial depth for the eye. A green item colored over a red item makes the eye want to reverse their position. But, Strain has purples and green intermingling with reds all over the place. This might make the magical realms that Strange visits to be more interesting, with a laws-of-physics-defying “up is down” nature, but I don’t get the impression that to be the intention here. On the positive side, the demonical insectoid Chosk-Dynn and the living salad-bar appearance of Baroshtok; the caretaker of another dimension, all show a great sense of imagination and artistic freedom. Kudos go to Emma Rios for providing such interesting entities. I'll even credit Strain with a detailed and appealing coloring scheme for the Dynn's true form despite the green/purple hazards. Rios and Strain also provide an excellent half-page collage-like series of vignettes that detail Strange’s origin. It shows an obvious nod to the works of Steve Ditko and Gene Colan – both inspirations for Rios in this project. As a whole, this is an excellent appearance, with some good dialogue (and a powerful example of frustration) by Strange, and stands as the very best issue in the series. The third issue introduces many more menaces (or some who are merely menacing) with Strange and Casey being “abducted” by a demon who asks Strange to help him combat an even worse demon who has taken over one of the deepest pits of hell. OK. It’s not “hell”, but it is the Bibb County, Georgia Annual “Little Miss Buttermilk” pre-teen Beauty Pageant – a more horrific setting I can not imagine. Honestly, those beauty contests are disturbing to me in every conceivable manner – and as such is an interesting venue for demons to make their soul-pacts since every one of the mothers involved with such things are evil. Still, I also dislike that this seems more like a fitting “John Constantine; Hellblazer” or “Zatanna” story than one for the former Sorcerer Supreme. Unfortunately, while DC has such characters at the ready, Marvel doesn’t really have a star-quality D-list magic-user to use here. The friendly demon who has requested aid from Strange is “Larry” (real name Laroximous Boneflayer). A satyr-like beast, “Larry” is a visual mix of the arch-demon ZOM and Rintrah (Strange’s apprentice in the 1990’s). In fact, “Larry” seems far too much like Rintrah that it would have been nice if Rintrah could just have been brought back to use in this. Still, one too many “apprentices” would be confusing (and with the exception of his first few appearances, I never really liked Rintrah all that much anyway). 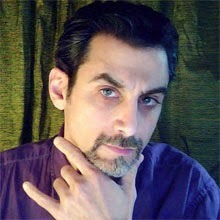 “Larry” is a retired soul-dealer demon who was basically forced out of the biz by the newer breed of demon, named Virilian, who (with a sly dig by Waid at the Banking industry) cooks the books and believes that doing unethical business (such as making the same pact with all parties involved, thus cheating all of them) would rather suffer a slap on the wrist and “pay a small penalty” for breaking the rules, while still reaping in the even bigger rewards of his even-more-than-usual dishonest practices. 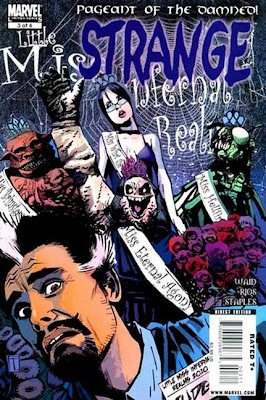 The issue splits the action between Casey, who has to infiltrate the pageant and Strange with “Larry” journeying to a pocket of hell to find the misappropriated souls stolen by Viridian. Mark Waid writes several things into this issue that need to be commended – or corrected. Firstly, he has Larry mention the fact that Strange has “survived the ‘Big Bang’ ”, a reference to the fact that Doc saw the “creation” of the universe by Siseneg/Genesis waaay back in Marvel Premiere. Awesome! Larry, despite being a demon, has obvious respect for Strange. A great continuity-nod by Mark Waid. Waid slips up however, when Strange and Larry journey to hell. Strange replies “In ASTRAL form”… explaining that the sounds and smells are filtered by being on the astral plane. That might well be true, but Waid should know that Doc has been to hell (various “hells” in fact) several times before while in physical form. It would have been more appropriate for Strange to possibly comment that he feels the effects of hell more now that he is “lessened” in mystic strength. Still, Waid has Strange stride forth through the bowels of the dark domains with his usual commanding nature – beseeching the wretched spirits within to grant him information. Casey, meanwhile, discovers the perils of the not-so-straightforward nature of dealing with magic. First, she misinterprets what she sees through her “true-sight” glasses, and then discovers the dangers of having any “dealings” with devils. All good plot points by Waid. 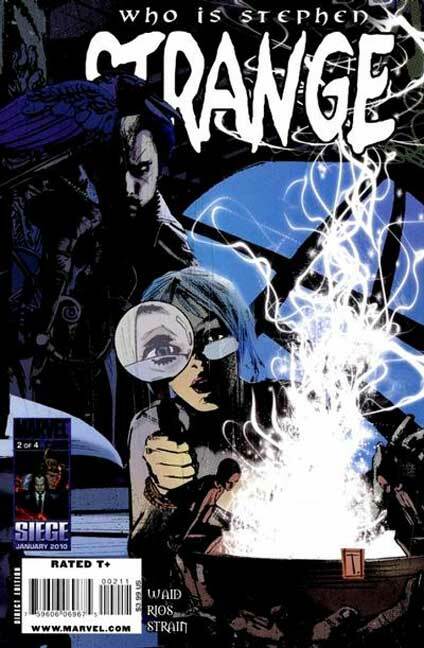 In what is a most irresponsible move since a guy dressed like a flying rat encouraged a pre-teen boy to dodge bullets while wearing short-shorts and a bright red target, Strange prevents Casey from volunteering to sacrifice her own soul to help fix the situation which is rapidly deteriorating around them. This is, because it seems that when Strange attempts to make the same offer, he is told that he doesn’t appear to HAVE a soul! In the frenzy of someone needing to do something, Casey steps in and signs her soul away. Strange may have been caught off-guard, but I still don’t believe he couldn’t have prevented it. Even with her sacrifice, only one danger is averted, but there is a far greater problem to be dealt with – “magic is having a fit”. Visually, Ema Rios’s art is much less impressive than last issue. Her best work here is her design for Virilian, that of an old-world, new-romantically dressed satyr – as well as the scene(s) of the lost souls held captive in his hell – one page especially (but I won’t give that away). The rest of the issue feels rushed. All of the human characters in this issue – except for Strange, the “real” Casey and the human-form of Virilian, are stiff and misshapen. Also, like the previous issues, once the action gets intense, the art becomes difficult to follow. That is a mixed fault between Rios’ tendency to add swirling lines all over the place (magical fire and energies) combined with the overly light/dark color palette – provided in this issue by Val Staples. The cover art looks like it was done by someone other than the team responsible for the other - truly great - covers in the series. This one does nothing for me - or for Strange. As a whole, this issue is not as good as the last, but better than the first. It’s is up to the final issue to make or break this series. The final issue starts where the last one ended; “magic is having a fit”. Strange manages to teleport himself and Casey to the ruins of his Sanctum Sanctorum – which he keeps hidden behind an illusion of it being an empty lot. Strange, faced with two serious dilemmas; to retrieve the soul of Casey and to heal the magical nature of the universe - is forced to prioritize. It is Casey, nearing the end of her transformative “origin” from selfish brat to selfless hero, who makes the call – likening it to the “rules of triage” – deal with the worst cases first. Waid posits that Strange; the former mystic is not the one who can do any good here, but Strange the former surgeon… can. Strange must perform a mystical surgery on the universe – most specifically the entity known as Eternity in order to repair the damage. It might just be me, but that is a mixed message if ever there was one, in what is a series that has specifically taken the “Doctor” out of the title. One nerdly problem with this is that this “performing surgery on Eternity” plot has been done already fairly recently (about a year or so ago, Doc had to perform surgery on Eternity in the pages of Fantastic Four (issue # 550) – using the hero “Gravity” as his scalpel). While here, Doc uses a sliver of Eternity itself as the mystic blade, it still seemed like a misplaced story point. Mystical and magical guest-stars (both hero and villain) are shown being beset by magic gone awry. Even Doctor Voodoo – the guy who got Strange’s old title of Sorcerer Supreme –is unable to do much against the overwhelming nature of the magical convulsions of the world. So it is up to the one guy who has been “demoted” and “downsized” from his old job to do that job properly? Then, what the hell was the point of this entire demotion?!? Strange, who was being removed from being the mystic "too big for the room" is being forced to go in that direction - all in a mini that was designed for him to be given a new, more reigned in direction. All this does is reinforce my belief that the problem isn't that Strange is too powerful - it is that the writers can't NOT write themselves into corners! What could be a major mistake/slip-up/ oversight/ nit-to-pick is that Strange heads off in astral form to perform his surgery on Eternity... which itself makes sense - since his astral form should not suffer the same trembling hands caused by his physical hands' being crushed. However, if Waid is following the rules (and he seems to be the only one doing so), then he should know that Doc's hands were crushed IN his astral form. It was the astral hands that were crushed which (in some inexplicable manner) caused the damage to his real (physical) hands! So, his astral hands should be just as useless as his real ones. So, he'd be useless as a surgeon, mystical or not, just as he was back in his origin, 46 years ago. Of course, I am SURE that I am the ONLY one to think of that, so maybe there's something wrong with me. Visually, this issue is more good than bad. All the more placid and introspective scenes - the quiet moments between Strange and Casey - are golden. Some of the action scenes do get a bit cramped, but this time nothing much is really happening in those panels to worry about missing any details. 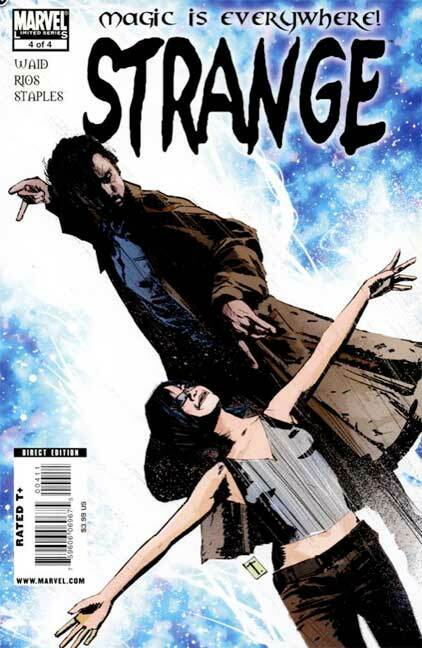 The issue comes to a head while Strange is away in astral form and Casey is left to watch over his body while using a scrying gem to search for her missing soul. 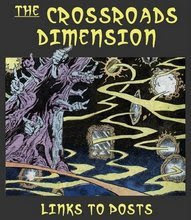 It is as Strange is helpless to intervene that long-time classic foe; Silver Dagger uses the chaos as a time to attack and Larry, showing his baser nature, tempts Casey with her soul shard. Casey, caught between a mystical rock and a metaphysical hard place, makes a dramatic and defining decision. I won't give away the ending to those who are looking to read it. The end is arguably NOT the way you want to go on a limited series -with no guarantee that anyone at any time will follow up on it. In fact, in reading the story "Rondeau" in "Girl Comics" # 2 (an intense review of which can be found in a recent post [HERE]) a negative clue is placed that things don't pan out as well as we would hope. This issue, in all regards from cover to cover, manages to be a step up from the last and places itself in second place as far as overall quality in this series. The final issue and the series ends with cliff-hangers and dangling plot-points – many I fear will never be resolved (or if they are – will be footnoted one-panel continuity fixes somewhere down the line). Sadly, the final issue failed to pull a "rabbit from the hat" trick that was impressive enough to make the series a positive one. Sales for this series failed to impress, and the future of Doctor Strange as a potential title-character might fail along with it. It remains to be seen if the sales of the collected format will help overmuch. With a few added pages showcasing “Super Hero Squad” variant cover art, some original sketches and commentary by Emma Rios – and coming in below the combined cover price of the originals, this collection might do better than expected. Certainly, all the brightly colored and “anime-like” (manga-lite?) artwork that I find fault with might just be what pulls in readers who flip it open in the book store. However, confusion between the actual cover art style (dark and serious) and the interior art (bright, anime/manga-inspired) might cause some problems. If you are interested in the recent situations facing Doctor Strange, Dr. Voodoo and magic in the Marvel universe? Maybe. It depends on how interested you really are. If you are someone who has little experience with Dr. Strange and want to know him better? Well… probably not, unless you like brightly colored, anime-looking artwork and have no desire to read older, “out-of-date” stories. If you are a die-hard Doctor Strange fan, then the answer is YES. Obviously. The covers say Noir, but the insides said Manga. If one drew the circles of both groups within the larger comic group, how much would the circles of noir and manga have over lapped? At a guess, not very much. Great way to help the sales marvel. I'm torn. On the one hand you have these teasers that I'm curious about in your review; on the other hand I'm actually not that interested in current continuity and would rather this series had a timeless/apocryphal quality a la "The Mystic Hands of Dr. Strange" (which I sadly do not own since my local Forbidden Planet sold out of it). I love the over-analysing detail though - excellent review! If JMS's mini was Dr Strange as seen through Matrix vision. Then I think Waid's version was remade by way of Doctor Who. Maybe that's why they took Doctor off the cover as it might have seemed too obvious. Ditko's Doctor Strange started off looking slightly eurasian, so a slightly ethnic look isn't completely off the cards. Although as someone on a comic forum pointed out, his background is now so firmly nailed down to midwestern wasp. that the only logical place for his earlier asiatic look would be if he was part Dakota sioux. Unfortunately Casey and Virilian also look of other ethic background so I suppose it might just be part of the manga look. Secondly the loss of Strange's soul. Very silly of Waid. What WAS he thinking of? My best guess is that he thought the mini would sell so well that it would go straight to ongoing title. Perhaps the quickest way out for this dangling thread is suggested with the words, "Sorry I'm trying, but I can't get to it. it's like....It's like it's not even there." It's like it's not there, but maybe it still is. Perhaps Strange's soul is protected by higher forces, and he can't give it away even when he wants to. it's totally better than the marvel legends one! and the guy used iron fist as a base, also kinda cool. Based on the New Avengers #1 preview, it looks like Bendis is completely ignoring this miniseries anyway, since Stephen is not only perfectly capable of casting spells, but he even uses a spell from the Book of the Vishanti. So much for "corrupted by black magic". Nice of him to give lip service to Jericho, though, even if Strange is the go-to guy of record.